Interim school superintendent to have an open-door policy – Welcome to Wyandotte Daily! Interim Superintendent Julie Ford promised an open-door policy at the July 3 Kansas City, Kansas, Public Schools Board of Education special meeting. Dr. Ford said she had been on the job only 48 hours, but her impression was the staff was good, kind and willing to help. The staff has told her they’re there to do whatever they can, she said. Dr. Ford said she was there to help in any way. As interim superintendent, she would be the caretaker for the district, she said. Dr. Ford, from Topeka, is the interim superintendent under contract for 60 days or less, she told those attending the board meeting. Dr. Charles Foust, currently in Monroe, North Carolina, was chosen to be the new superintendent at the June 26 meeting. Dr. Ford said she was in communication with Dr. Foust, and had told him that the staff was a nice group of people who are helpful. While people have been focusing on the negative, “we’ve got to see the good and tell people the good we’re seeing,” she said. Even in a bad situation, there will be some good, some opportunities to get better. “We have to believe, the kids are counting on us,” Dr. Ford said. The fourth part of her personal mission is to help any way she can, she added. Last week was the final board meeting of former Superintendent Cynthia Lane, who retired. Also, it was announced last week that David A. Smith, former chief of staff and chief of public affairs, had resigned effective June 30 and was accepting a position as chief of communications in the Shawnee Mission School District. 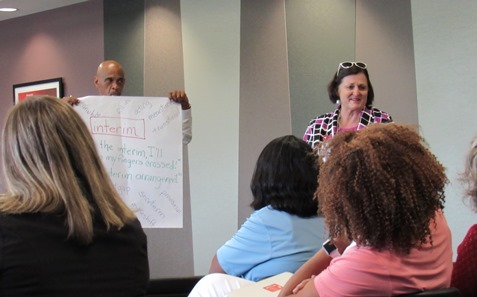 More exits of the district’s top experienced administrators may be coming in the future, according to the July 3 school district human resources report. An assistant superintendent, Dr. Marci Clay, was listed in the human resources report as retiring Jan. 1, 2019, and another of the district’s top administrators, Dr. Kelli Mather, chief operating officer, was listed in the report as resigning in a voluntary separation effective Dec. 31, 2018. During the July 3 meeting, the board did not take action on filling the vacant chief of public affairs position. Dr. Ford said her recommendation would be to wait until Dr. Foust is there to fill that position. Personnel items that were originally on the June 26 agenda, including hiring personnel, were continued from June 26 until July 3. A 2 percent raise was approved July 3 for classified employees, excluding administrators, for the 2018-2019 year. The board also approved a revised employee salary schedule. The schedule has steps and classes for groups of employees. Slight changes in the schedule were made that were a better fit for some positions, according to district staff. Dr. Stacy Yeager, a board member, made a motion that removed a new Class 11 and 12 from the administrators’ category on the salary schedule, including positions such as chief of staff, chief operating officer and assistant superintendent, because they were negotiated positions. Those salaries that were removed from the salary schedule were in the $98,500 and up range. Class 11 ranged from $98,500 to $129,968, while Class 12 ranged from $115,000 to $151,740. The board held closed sessions at the July 3 meeting to discuss teacher negotiations, to discuss personnel application information, and to review salaries and benefits. The salary for the new superintendent, Dr. Charles Foust, has been reported at a base salary of $230,000, with additional benefits and an $800 a month transportation allowance. The 2017 salary for former superintendent, Dr. Cynthia Lane, was reported at $232,646, including transportation allowance, by Kansasopengov.org. More than 10 other KCK district administrators’ salaries were reported at more than $100,000. One of the audience members from the community remarked after the July 3 meeting that the board was still micromanaging everything, and had not changed its practice of going over the small details, although a new administration was in place. The school board hired auditors to look at the district’s administrative staff, and has held a series of community listening tours with district patrons. The school board on June 2 approved a contract 5-2 for an audit of the senior administrative staff at the school district, estimated at about 30 positions. The $85,000 maximum contract was with Corporate Integrity Systems, and bids were not taken on the contract. The audit reviewed the district’s compliance with board adopted policies on recruiting, hiring and assignment of compensation for administration positions in the district, according to a letter outlining the audit. At the board’s June 26 meeting, a closed executive session was held to discuss the results of an investigation by Integrity Consulting Solutions. Dr. Ford said the district is behind in its budget planning for the coming year, yet it is ahead of some other school districts in Kansas. Typically budget training takes place in May or June. The Kansas City, Kansas, district has already done some budget planning, according to officials. Many districts waited for the Kansas Supreme Court’s ruling last week on school finance to see how much would be available. Staff is planning to go to training on the budget in mid-July, Dr. Ford said. Dr. Mather said the state is preparing forms that will be used for budgets, but the state forms may not be released until after July 17 or 18. During a discussion on the budget, Dr. Mather said about $4.2 million is expected to be received by the general fund through the school finance legislation, in addition to $1.5 million in special education. The board already has reviewed the budget, and saved $677,000 from the general fund, she said. The board previously has said it wanted to keep the mill levy flat, she said. The school district is anticipating the Legislature to add funds to cover inflation and reinstate inflation dollars, according to the court ruling issued last week. “That money’s not here, it’s not in the bill, the Legislature will go back in session in January and they’ll have to make a decision on it,” Dr. Mather said. If they decide to add it, that may mean an additional $3 million for the school district, according to an estimate, she said. “The money doesn’t really exist yet,” she added. Among the expenditures planned are an increase of $1.5 million in health insurance coverage, compensation for staff, an increase of teachers, early childhood teachers, alternative programs and transportation costs. Also, there is a plan for additional social workers, as well as several other items. Special education funding came in about $1.6 million less than anticipated, she said. There was some discussion about cutting convocation costs from $20,000 to $10,000. Also, there was discussion about the superintendent having individual meetings with board members to discuss their ideas, if necessary, including ideas about the budget. Dr. Ford said they reviewed the expenditures to the district’s lobbying firm and also the expenses for litigation in the school finance case. She expected costs could be less in the coming year for these expenses. There were about 50 other districts in the school finance case, according to board members. According to officials, the district uses a rebate on public utilities to pay for the costs of the school finance litigation. They will hold off on filling the public affairs position, look at the lobbying expenses and watch the school finance litigation expenses, she said. At the June 28 Unified Government Commission meeting, Cardelia Walker, a real estate agent who has served on the City Planning Commission in the past, spoke during a plan review for a new district school near 88th and Waverly. Walker asked how the property, about 15 acres in a residential and wooded area, could be sold to the district for about $670,000, at a price of more than $40,000 an acre. She said similar vacant land in the area would not have been sold for more than about $3,000 an acre. Walker owns some unimproved property nearby and was concerned that her appraisals and property taxes would go up. She was certain that she would not be able to sell her property for $40,000 an acre or more. A similar question came up last February when the school board wanted another appraisal on this property. The board was criticized by some community members after the board did not seek bids on the second appraisal, and it turned out that the second appraiser the board wanted did not work on these types of properties. Dr. Mather said that their original decision had relied on a lengthy report from a reputable commercial appraiser. The school district doesn’t buy property all the time, and it relied on the appraiser that it hired, she said. The new school location at 8833 Waverly Ave. is in a residential area, but it is only about three miles from very pricy property at The Legends Outlets shopping center. The land portion of the new school property was listed on UG property records as being appraised around $60,000, according to Walker. UG property records listed the owner of the property as the Peggy Serviss Trust. Peggy Hanlon Serviss is the spouse of the late Board of Public Utilities member, Al Serviss, and the daughter of the late Kansas City, Kansas, Finance Commissioner Pat Hanlon, who was in office in the 1970s. UG staff last week had a lot of questions about the plans for the new school, including questions if roads and sidewalks in the school area were adequate, and the plan review for the new school was sent back to the City Planning Commission. The new elementary school near 88th and Waverly is being named for Lowell Brune. While UG planners said at the UG meeting that they think some students will walk to the new school because there are some nearby residences, the school district said it was changing the busing policy for Brune Elementary, and that all students there would be riding the bus. School security also was a topic at the July 3 school board meeting, which had a long discussion about security with the school district’s police chief. The district’s new school buildings, and the remodeled buildings, are adding new security features. Dr. Valdenia Winn, vice president of the board, who presided over the July 3 meeting, said constituents were interested in more security at the schools, and she asked about the possibility of adding additional school police officers. Currently there are about 40 persons in the school police department. Upcoming Kansas City, Kansas, Board of Education meetings are at 4 p.m. Tuesday, July 10, and 4 p.m. Tuesday, July 24, at the third floor auditorium, Kansas City, Kansas, Public Schools Central Office and Training Center, 2010 N. 59th St., Kansas City, Kansas. More details can be found in the July 3 school board meeting, online at https://www.youtube.com/watch?v=3kgL-moGcPI. The Feb. 13, 2018, school board meeting is online at https://www.youtube.com/watch?v=z91m3aXLTJ8. The Feb. 22, 2018, school board meeting is online at https://www.youtube.com/watch?v=3E34AetLKUU. The June 28, 2018, Unified Government Commission meeting is at https://www.youtube.com/watch?v=F1owrndxlsk.